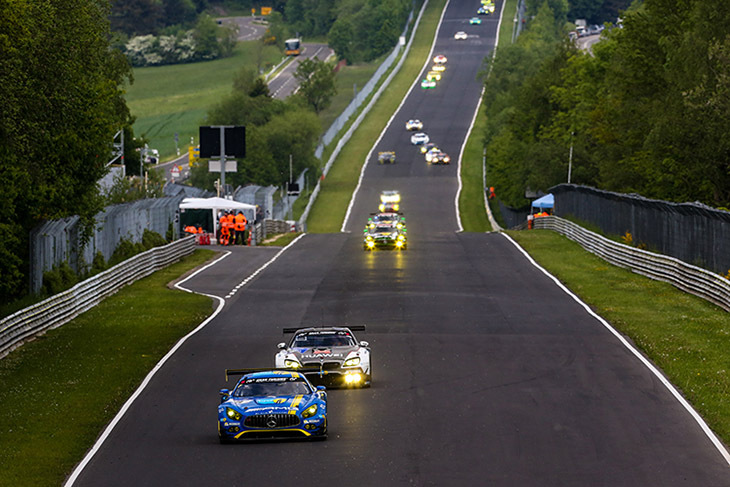 The 44th running of the Nürburgring 24 Hours had everything, including a one-lap shootout at the end and a hail storm. Mercedes came out and dominated, with the #4 Black Falcon Mercedes AMG GT3 of Maro Engel, Bernd Schneider, Adam Christodoulou and Manuel Metzger taking the win in what turned out to be a four-way battle for the lead for much of the second half of the race between AMG GT3s from three teams. But it was by no means a traditional formation finish for the Stuttgart brand. 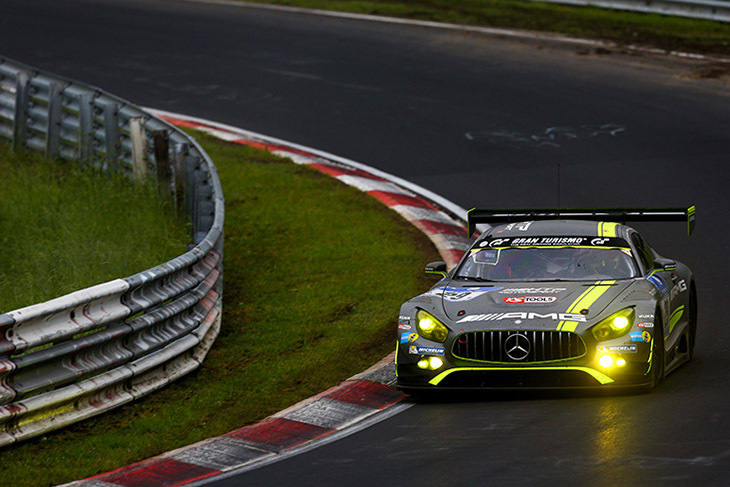 This race will always be remembered for the last lap dash to the flag, which saw Maro Engel barge his way past the #29 HTP Motorsport AMG GT3 of Christian Hohenadel on the final tour of the circuit after a splash and dash bunched the top two up for a sprint finish. 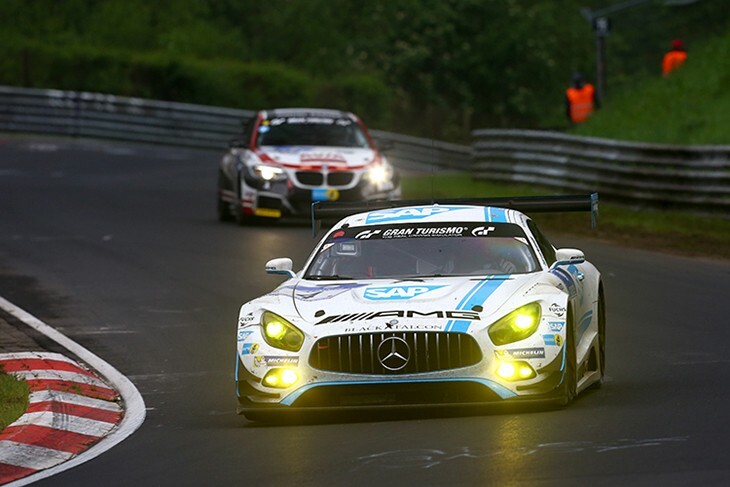 With the result, Mercedes claimed its second victory at the N24, which remarkably were both with Black Falcon, and Schneider. Engel, Metzger and Christodoulou meanwhile, took their debut wins. 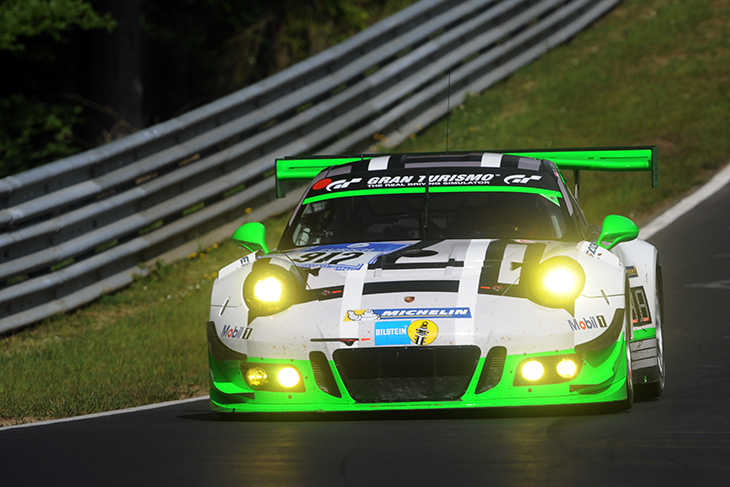 It was also the second year in a row in which a new GT3 car won on its debut at the race, after the R8 LMS won in 2015. In a race which included a fleet of new GT3s from three of the four German factories gunning for the win, Mercedes provided the answer to the question on everybody’s mind before the start: could one of the new cars take the win, and if so, in what fashion? The BMWs, Porsches, Audis, Aston Martins, Bentleys, and Lamborghini were in the end no match for the new AMG GT3. Of the eight that took the start, four of them had faultless runs to the finish in tricky conditions. For the #4 crew it was a dream result, one that was hard earned, and involved out-smarting opponents on the same equipment. The car led just eight of the 134 laps. On the other side it was an absolutely heartbreaking end for Hohenadel and his teammates Marco Seefried, Christian Vietoris and Renger Van Der Zander. 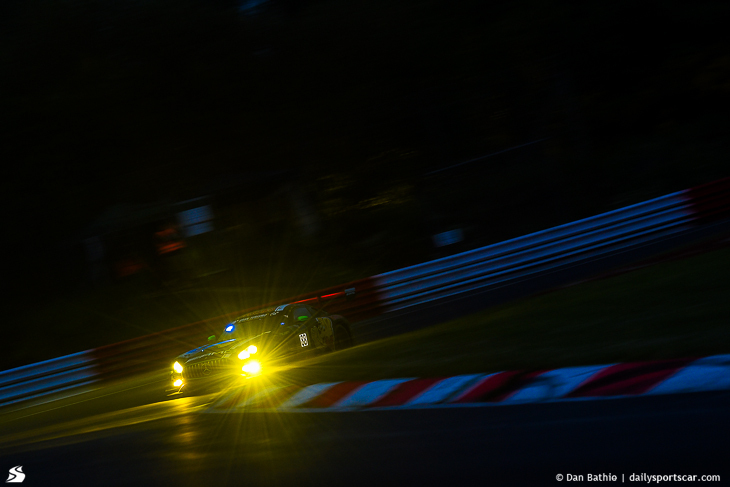 Coming home third was the #88 Haribo Mercedes of Uwe Alzen, Lance David Arnold, Max Götz and Jan Seyffarth which led the majority of the race before a costly penalty for disobeying Code 60 rules cost them dearly in the final hours. Just off the podium, the #9 Black Falcon Mercedes finished fourth with the first non-AMG GT3 fifth, the #23 ROWE Racing BMW M6. At the start of the race, the #9 pole-sitting Black Falcon car got off to a great start with Maro Engel driving (he drove two cars), ahead of the #18 Schubert BMW. But torrential rain and later hail would force the organisers to stop the race at the one hour mark. The rain came down so hard that multiple cars went off the circuit, aquaplaning into barriers, and when the hail came, it froze, leaving the Nordschliefe looking like it had been snowed on. With a number of cars stranded out on circuit, unable to climb the hill to the end of the lap because of the ice, the clear-up took three hours. 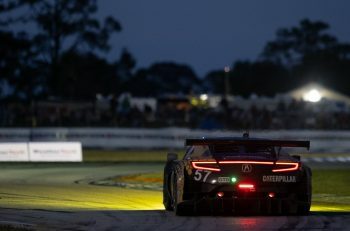 When the race went green again it was still under dire conditions, with heavy rain across parts of the circuit, but the majority of the field kept it clean in the borderline un-drivable conditions. 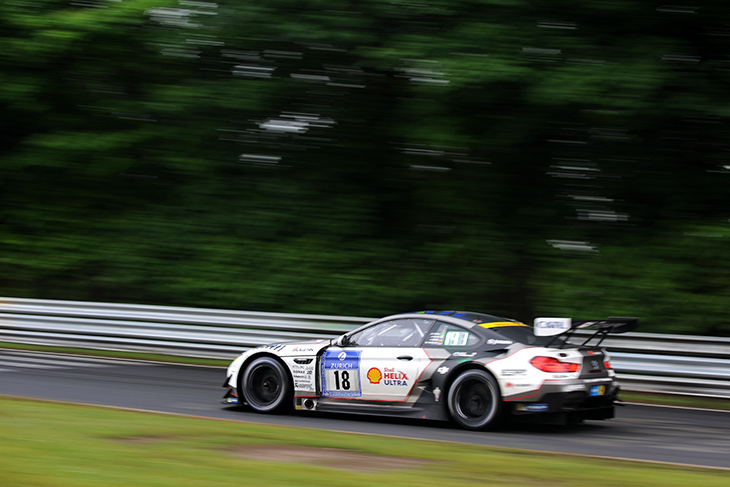 The #18 Schubert BMW took the lead of the race, but its engine blew while going down the Döttinger Hehe just after the sixth hour concluded, ending it, and effectively BMW’s chances of victory. 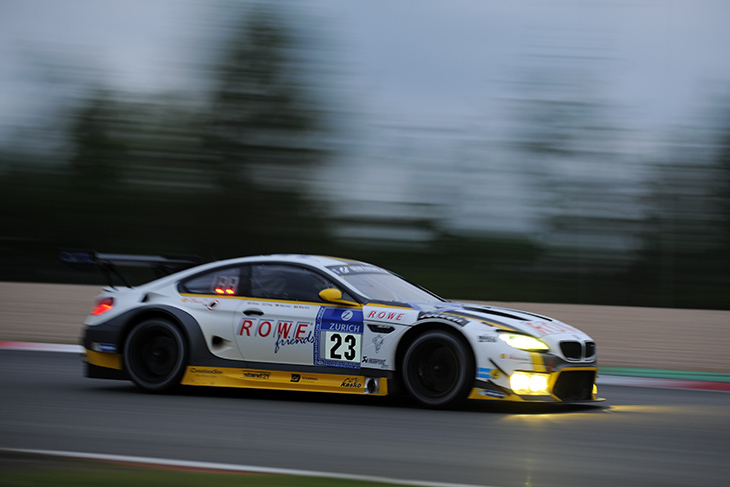 All the other M6s in the race would suffer mechanical issues, delays or crash out. Porsche and Audi too, couldn’t mount a challenge with their well developed cars. After rebuilding the #911 Manthey Porsche all night following Kevin Estre’s off in Top 30 Qualifying, Nick Tandy crashed out in the opening laps. The sister #912 car meanwhile looked as if it would mount a challenge, lurking around the top five and on the lead lap for much of the race, but it too would retire with a mechanical failure. Audi’s chances of victory ended within the space of 20 minutes, with the #1 WRT Audi, #6 and #23 R8s all retiring simultaneously. Markus Winkelhock’s incident in the #6 Phoenix car, hitting the #23 Land R8 was the big story, hitting its rear on the GP loop on Sunday morning, damaging both cars terminally. 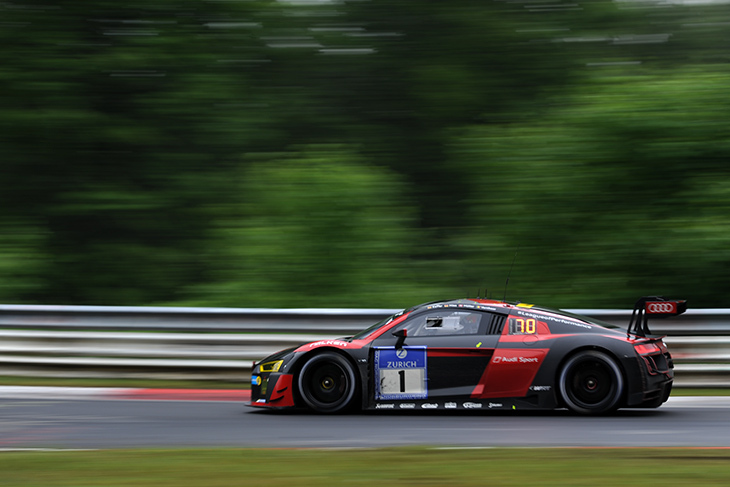 The highest finishing R8 was the #2 WRT Audi of Stuart Leonard, Robin Frijns, Frederic Vervisch and Edward Sandström. The entries from Bentley, Aston Martin, and Lamborghini meanwhile never challenged up front. All five cars in question had accidents which were either terminal, or heavy enough to prevent them from being a factor. As early as the 12-hour mark, the race began to look like a Mercedes whitewash was on the cards, but thankfully, the AMG squads fought until the bitter end, all using different strategies which up until the final round of stops, left the top four places hanging in the balance as the rain continued to come and go around the ‘Green Hell’. 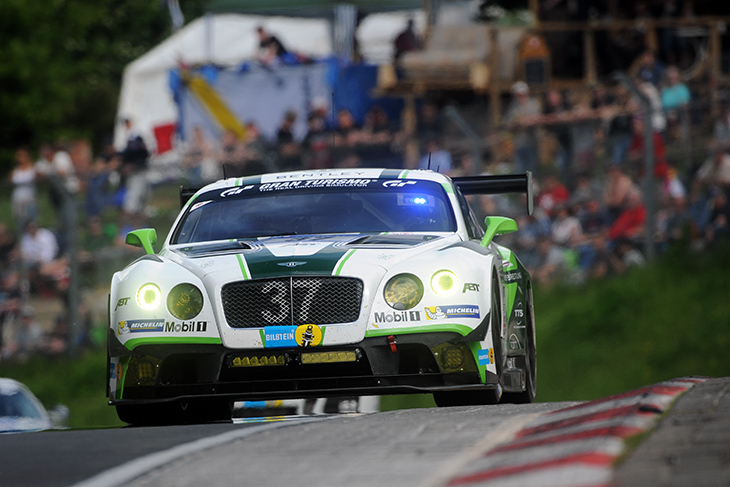 In the final hour, the #4 sat second, 55 seconds behind the leader. 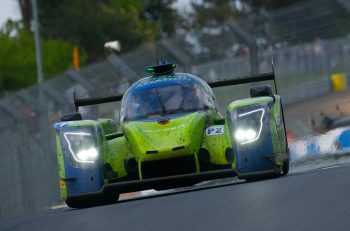 The HTP car was marginal on fuel, dived in for a splash and had to be push started down the pit lane to rejoin the race. Hohenadnel did everything he could to preserve the lead through the traffic, but it wasn’t to be, as Engel drove the best two laps of his life, capping it off with burnouts at Turn 1 after the finish. 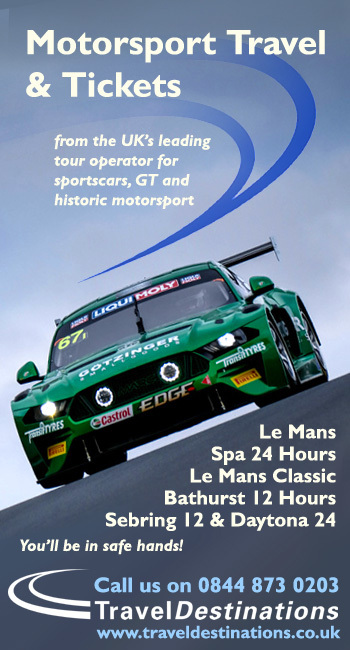 It was an absolutely unbelievable race, which will go down in history as one of the great endurance races of all time. There were so many stories up and down the field, but the one which everyone will take away is that in 2016, Mercedes was king of the ‘Ring.